Scanning the quarterly figures of some of the major logistics service providers, the global logistics market looks fairly stable with respectable growth in most areas and strong growth in markets such as air freight. Deutsche Post DHL Group, for example, saw its PeP (Post-eCommerce-Parcel) business grow its e-commerce parcel volumes by 7-9%, depending on the market. Profits were depressed by higher wage costs but overall the e-commerce logistics business is growing well. The increasingly e-commerce orientated DHL Express grew even better, with shipments up between 9-12% depending on the type of shipment. All of this suggests that the e-retail economy is, if not booming, then growing respectably worldwide. In the area of freight forwarding, Kuehne + Nagel saw sea freight volumes growing reasonably at 5% year-on-year, but air freight growing very fast at 21%. Expeditors saw roughly similar growth in sea freight however air freight was more subdued, possibly due to Expeditors focussing on growing its profit margins. DHL Global Forwarding was more complicated, with falling volumes in both markets, though it experienced an explosive recovery in EBIT of 75%. This is likely to be a reflection of the continuing recovery of DHL Global Forwarding’s business rather than any comment on the market. Panalpina is also more complex, with volumes falling in sea freight whilst air freight only saw a 3% rise. In both however, profit margins are improving. Some indicators suggest that world trade may have undergone a slight setback in the early part of 2018 with exports from developed nations such as Germany slowing markedly, yet it is assumed that this is only temporary. 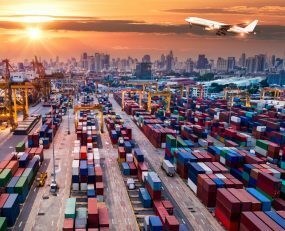 The World Trade Organisation has predicted that world trade will grow at over 4% this year and so far, the numbers from major logistics service providers support such a forecast. It is noticeable that air freight is growing faster than sea freight, although why this should be is unclear from the forwarders’ results. It is also noticeable that in air freight as well as sea freight forwarders appear to have re-established their pricing power. This suggests that the supply of ships and aeroplanes has grown since last year. This is unsurprising in shipping but more surprising in air freight.